That's the message of slick new ads from Facebook, Uber and Wells Fargo, which are trying to atone for very public problems — and taking varying degrees of responsibility. Each of the three companies launched campaigns in the past few weeks that may limit the damage. Facebook has been tarnished by a vast data breach, Uber by complaints of rampant sexual harassment, and Wells Fargo by its repeated mistreatment of customers and workers. "These are all classic apology ads," said Tim Calkins, a marketing professor at Northwestern University's Kellogg School of Management. Whether they will inspire forgiveness is another matter. An effective apology ad addresses the "elephant in the room," said Tony Calcao, executive creative director at the advertising agency CP+B. Calcao worked on the 2009 campaign in which Domino's executives acknowledged criticism of their pizza and revealed a new recipe. "If you want to get those customers back, you had better acknowledge that you screwed up," he said. Wells Fargo (WFC) owns up to losing its way. Facebook (FB) is more vague. And Uber says little beyond promising a "new direction." "We came here for the friends," Facebook's ad opens. 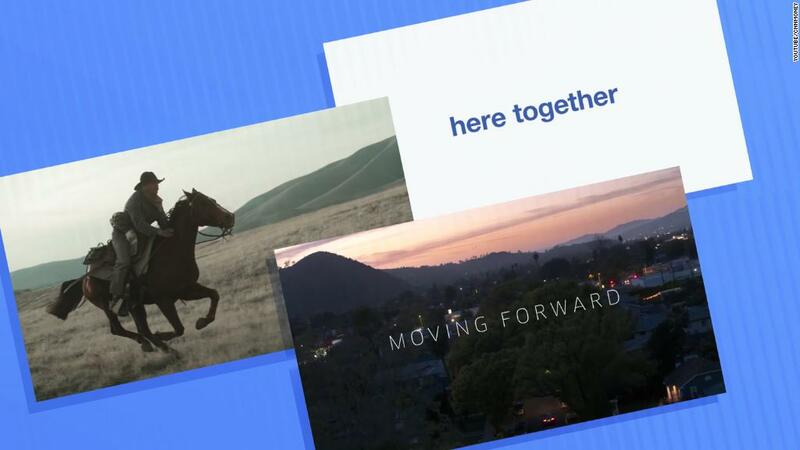 The campaign, "Here Together," tries to remind people of what made Facebook "good" in the first place. A gauzy, minute-long commercial presents Facebook as being all about stronger relationships. "Our old friends from middle school, our mom, our ex and our boss joined forces to wish us happy birthday," an earnest voice says. "But then something happened. We had to deal with spam, clickbait, fake news and data misuse." The company doesn't take direct responsibility for the "something" that "happened." It does vow a change: "From now on, Facebook will do more to keep you safe and protect your privacy." "The risk in the Facebook approach is that people may say it's an insincere apology," Calkins said, "and the company isn't really taking ownership of that issue." The ad will run through summer. It began testing in mid-March, before the Cambridge Analytica scandal broke. By then, Facebook had already taken a hit for enabling Russian meddling during the 2016 presidential election. The campaign includes digital ads, billboards, transit posters and cinema advertising, said Facebook spokesperson Lisa Stratton. "We are taking a broader view of our responsibilities, and we hope this campaign will show that we take that responsibility seriously," she said. Tulin Erdem, a professor of marketing at NYU's Stern business school, said she likes the Facebook ad more than the others. There's "more of an emotional appeal there," she said. "I think it's more effective." Calcao called the Facebook ad "well-executed" but too vague. "I would have preferred to know exactly what they're doing differently," he said. "Tell me exactly what it is that you fell down on." Uber took a more direct approach — at least in style. In its commercial, CEO Dara Khosrowshahi speaks directly to employees, customers and the viewer. "Since joining nine months ago, my priority has been to listen to you," he says. "It's time to move in a new direction. This begins with new leadership and a new culture." Uber's last CEO, Travis Kalanick, resigned in June after months of controversy. Under Kalanick, employees complained of pervasive sexual harassment at the company. Calkins said it's risky for Uber to feature Khosrowshahi so prominently. "It makes you very dependent on the person going forward," he said. "People make mistakes ... when you tie yourself to a brand, that can go very wrong." Calcao also noted that the commercial failed to mention Uber's shortcomings. "They're certainly not addressing any of the issues the brand has had in the past," he said. Like Facebook, Wells Fargo's ad tries to remind viewers of better days. "Back when the country went west for gold, we were the ones who carried it back east," a voice says, as horses pull a Wells Fargo stagecoach through the countryside. "Over the years, we built on that trust. We always found the way. Until we lost it." Wells Fargo has slogged through scandal after scandal for two years. The company admitted to creating fake accounts, hitting customers with unfair mortgage fees and charging people for car insurance they didn't need. The bank has been sued, slapped with government fines and had its growth restricted by the Federal Reserve. Calcao applauded Wells Fargo for specifying what it's doing to help regain customer trust. In the commercial, the company notes that it is "ending product sales goals for branch bankers." Unrealistic sales goals put pressure on employees to sign customers up for accounts they didn't want. The campaign also includes print and radio ads and posters in subway stations. Andrew Gilman, founder of the crisis communications firm CommCore Consulting Group, said the commercial skates past what Wells Fargo did wrong. Aside from mentioning the sales goals, the spot does not detail wrongdoing. The transition from "we were great, then something happened, now we're great again" seemed "too abrupt to me," he said. The print ad offers more details on the changes Wells Fargo has made. "This is a multi-faceted campaign," said Jamie Moldafsky, Wells Fargo's chief marketing officer, because "the content is complex." She explained that the company worked on the campaign for about six months. Ultimately, the companies will be forgiven, Calkins predicted. That's partly because it's not easy for people to give up Facebook, their bank or the ride-sharing service. And, he said, "when someone apologizes, we tend to forgive them."